Fitting the windows into your log cabin is a simple process, however, it can often be confusing when you offer the window into the opening and the gap above the window appears to be too wide. This gap varies according to how well the wall logs have settled into their tongue and groove and also the moisture content of the wood . Over the full height of the wall, the dimension can vary as much as 50mm. The window frame design incorporates a “sandwich” effect created by fixing the window frame strips to the outer edges of the frame internally and externally. 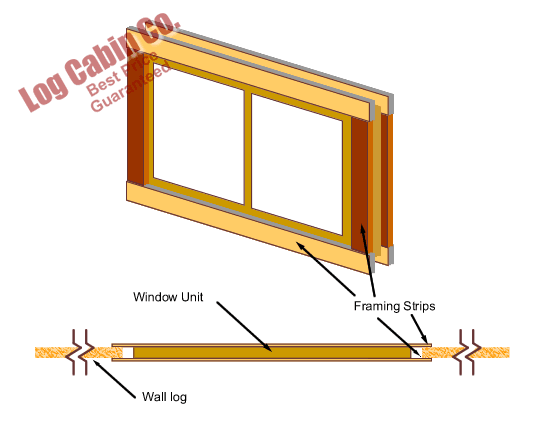 It is imperative these frame strips are only attached to the window and NOT the wall logs. This will allow the window unit to move independantly of the wall maintaining the wall integrety yet allowing the wall logs to move as required. And to re-iterate : The window frame strips must only be screwed to the window frame and should not be screwed onto the wall thus preventing wall movement !